The good news is that Elise is doing well and growing fast! She is almost three years old, has a great group of friends, she's extremely smart, speaks both English and Portuguese (I only speak to her in Portuguese) and is very excited to become a big sister (baby Mattias is scheduled to be born three days after Elise's third birthday). Joanne does an amazing job with the managing of insulin (three shots a day), food (weighing every single gram of carbs) and exercise (rec center, bicycle, walks, park, pool, etc.). While insulin and food are needed to keep Elise alive, exercise plays a big role in the equation as well and so it becomes a balancing act between the three. At her last endocrinologist appointment, her A1c (blood test that gives you an average of your blood sugar for the last three months) was so good - 6.6 - that it even worried some people (you don't want the A1c number too low when you're this young since it may be an indication that she's having a lot of low blood sugar numbers). The bad news is that she still has type 1 diabetes, and will have it for the rest of her life until we find a cure. Anyone with type 1 diabetes will tell you that it's a roller coaster ride. A lot of times stuff just doesn't make sense and there's not much you can do about it. There are days when you keep feeding her non-stop just to keep her blood sugar at a normal level and then there are days when you have no idea why her blood sugar is off the charts. 1. Create awareness by having at least 50 people walking with us on Saturday, September 25 at 9 AM at Granite Park in Plano, TX. 2. Fund research that can lead to breakthrough cures and treatments for type 1 diabetes and its complications by raising $10,000. 1. If you live in the DFW area or would like to visit the area at the end of September, we would love to have you on our team! Simply go to teamelise.com, click on Walk and then click on Join Team Elise to sign-up to walk with us. 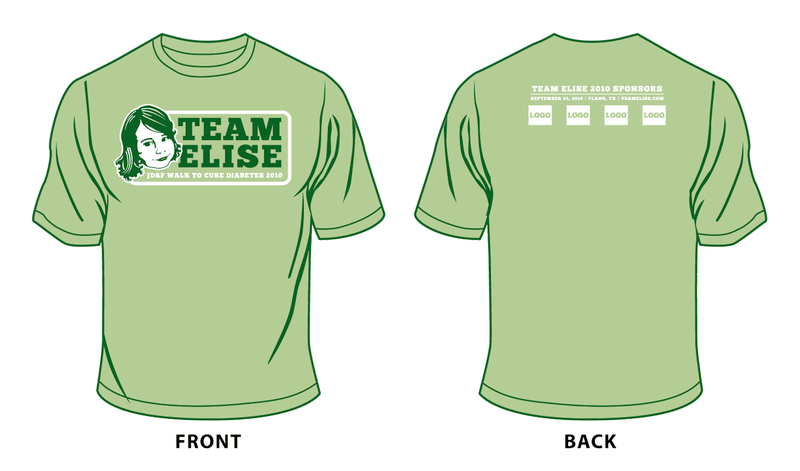 You will get a free and very cool Team Elise shirt (see the design below). Note that you do not have to raise money in order to walk with us, but are more than welcome to do so, if you wish. 2. If you're able to, we would love for you to donate to JDRF! Simply go to teamelise.com and click on Donate Now from any page to donate using your credit card. If you prefer to use PayPal, you can do so by clicking on Walk and then clicking on PayPal. 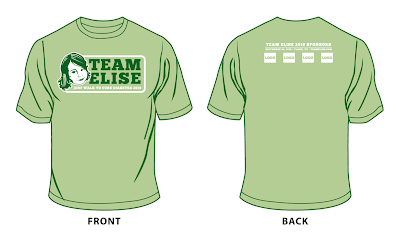 I would also like to thank Jonathan Rollins for designing this year's Team Elise shirt - I can't wait to wear it! -The shirt is AMAZING, no? -You should really check out the new Team Elise website. -We have had some incredible response from businesses in the area who are either willing to sponsor or help support Team Elise. We've even had a few restaurants offer to donate a percentage of their sales from a certain time period to Team Elise. We will update when we have some more solid dates. Hopefully if you live in this area, you will come out and not only support Team Elise, but the wonderful businesses too! Absolutely great! Go Team Elise! Wow love the tshirt and love the email that fred sent . fred is a wonderful poppa . I love it all . Have a great time at the walk and i hope you get lots of folks to join you . Okay, you have seriously got your stuff together. I work at an ad agency, and I don't even think I'd be able to pull of such a great-looking shirt and website.